On October 7, 1958, the new National Aeronautics and Space Administration (NASA) announced Project Mercury, its first major undertaking. The objectives were threefold: to place a human spacecraft into orbital flight around Earth, observe human performance in such conditions, and recover the human and the spacecraft safely. At this early point in the U.S. space program, many questions remained. Could a human function ably as a pilot-engineer-experimenter in the harsh conditions of weightless flight? If yes, who were the right people for the challenge? 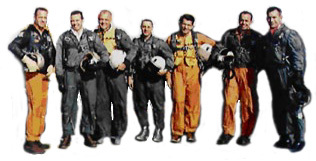 The selection procedures for Project Mercury were directed by a NASA selection committee, consisting of Charles Donlan, a senior management engineer; Warren North, a test pilot engineer; Stanley White and William Argerson, flight surgeons; Allen Gamble and Robert Voas psychologists; and George Ruff and Edwin Levy, psychiatrists. The committee recognized that the unusual conditions associated with spaceflight are similar to those experienced by military test pilots. In January 1959, the committee received and screened 508 service records of a group of talented test pilots, from which 110 candidates were assembled. Less than one month later, through a variety of interviews and a battery of written tests, the NASA selection committee pared down this group to 32 candidates. Each candidate endured even more stringent physical, psychological, and mental examinations, including total body x-rays, pressure suit tests, cognitive exercises, and a series of unnerving interviews. Of the 32 candidates, 18 were recommended for Project Mercury without medical reservations. On April 1, 1959, Robert Gilruth, the head of the Space Task Group, and Donlan, North, and White selected the first American astronauts. The "Mercury Seven" were Scott Carpenter, L. Gordon Cooper, Jr., John H. Glenn, Jr., Virgil I. "Gus" Grissom, Walter M. Schirra, Jr., Alan B. Shepard, Jr., and Donald K. "Deke" Slayton. At a press conference in Washington, D.C., on April 9, 1959, NASA introduced the Mercury Seven to the public. The press and public soon adopted them as heroes, embodying the new spirit of space exploration. Each one (except Slayton, who was grounded because of a previously undiscovered heart condition, but later flew as a crewmember of the Apollo Soyuz Test Project) successfully flew in Project Mercury. During the five-year life of the project, six human-tended flights and eight automated flights were completed, proving that human spaceflight was possible. These missions paved the way for the Gemini and Apollo programs as well as for all further human spaceflight.